Deciding to hire an online marketing company to assist with your dealership’s SEO campaign may be relatively easy to do. After all, it may be clear that you are not achieving desired, high ranking results through your own efforts. With multiple online marketing firms to choose from, you may be wondering why Customer Scout is the right automotive SEO company to hire. With a closer look, you will see that we stand apart from other SEO companies in critical ways. 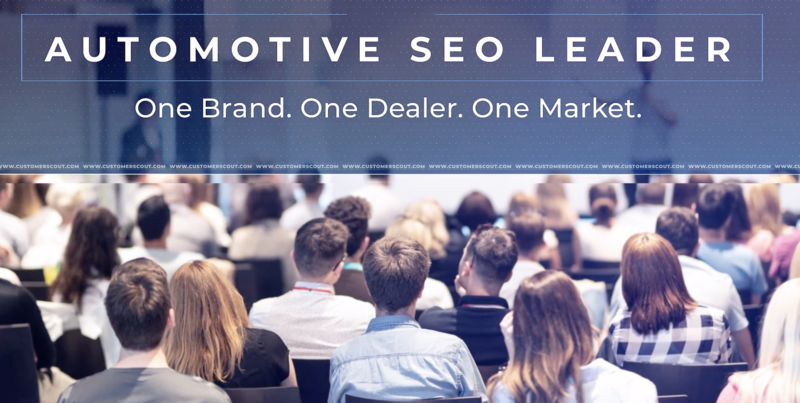 If you spend time reading customer reviews about our automotive SEO company, you may discover that our team of online marketing experts leaves nothing to chance. We are able to generate stellar results for our customers consistently because we take a comprehensive approach to developing each customer’s marketing campaign. This includes the successful and strategic use of local SEO strategies, geo fencing, content writing, business listings and other advanced techniques. Rather than develop a campaign and see how well it performs, we regularly review and analyze data so that we can make intelligent revisions. In this way, we are able to improve or maintain excellent results for our clients. While our auto dealership clients understandably want to achieve a high ranking with top search engines, the primary goal is to drive targeted traffic to your website. You need leads to enter your sales funnel through your marketing efforts. We are the automotive SEO company that has achieved proven results in this area on a consistent basis. Reading some of the many glowing customer reviews online about our company is one way to learn about our successes, and we are happy to provide you with accurate statistics about our services when you contact Customer Scout for a consultation. We understand the importance of market exclusivity when you hire an online marketing company. After all, our services would not place your company at a competitive advantage if other dealerships in your market were also using our award winning SEO services. We offer market exclusivity to each client, which means that you will be the only dealership in your local area that we work with. Through this guarantee, you can feel confident that your dealership will enjoy maximum benefits from our full range of online marketing services. Many marketing company promise to generate a high ranking from their search engine optimization services, but you understandably want to hire a company that has the proven results to stand behind their words. We are an award winning SEO company that has been recognized by Driving Sales for our top-rated services. Driving Sales is a professional organization serving the auto industry, and it has been recognizing excellence in this industry for many years.While you could grow increasingly unhappy with your sales numbers, a better idea is to take action by contacting Customer Scout today. We are eager to meet with you for a consultation and to tell you more about how our comprehensive and proven services may benefit your dealership. If your auto dealer website doesn’t appear high on search engines such as Google , you stand to lag behind when it comes to web traffic, sales and leads. We have successfully served dealership across the country. From domestic brands such a Ford, Chevrolet, Cadillac, Dodge, Jeep, GMC, to foreign brands Volkswagen, Toyota, Hyundai, Kia, Honda and more. Customer Scout understands the implications of perfect vs poor online visibility. To learn more how to INCREASE your market share online, to target key areas, increase opportunities and sales, please call Customer Scout or completed the form below so that we may contact to discuss how Customer Scout can better your dealership online. Pingback: Toyota SEO for Dealer Websites Search Engine Optimization | Customer Scout, INC.
Pingback: SEO for Harley-Davidson Dealers | Customer Scout, INC.
Pingback: Automotive SEO for Car Dealers | Customer Scout, INC.
Pingback: KIA Social Media for KIA Dealers | Customer Scout, INC.